A North East Lincolnshire church is to become known as Grimsby Minster after it is given the new status by the Bishop of Lincoln. 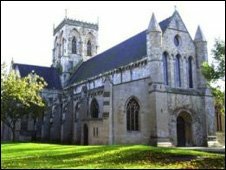 St James's Church in the centre of Grimsby will be given Minster status at a ceremony on 16 May. The Bishop of Lincoln said the dedication was a "sign of the church's commitment to the local community". The 13th Century church will become a hub for ministers from the surrounding parish areas. The Bishop of Grimsby, the Right Reverend David Rossdale, said: "I am delighted that North East Lincolnshire will have a Minster church and I know that Grimsby Minster will be a place where the church can gather, celebrate and work together in mission. "St James's Church has served the people of Grimsby for more than 800 years and now it will play a major part in the regeneration planned for the centre of the town." The Bishop of Lincoln, the Right Reverend Dr John Saxbee, said it was rare for parish churches to be given Minster status. He said: "The dignity of a local authority having a Minster church is not given very often, but it is a sign of the church's commitment to the local community." The leader of North East Lincolnshire Council, Andrew De Freitas, said the change was "a proud moment" for Grimsby residents and "a significant step" in raising the profile of the county.